Yup they all look like backstabbers. What about Adrian the Azole? Did he ever finish his canon law studies in Canada? Where is he and what is he doing now? 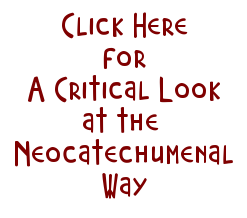 These are the fruits of the NCW that the Church around the world needs to be made aware of. The truth about this NCW cult must be made public to protect the many unsuspecting and vulnerable victims from being lured in to this cult. Good for Byrnes to expose all "going ons" in Church. Shows how much more corruption is also in Catholic Church in Guam. His fixing these problems will showcase his ability to serve the people of Guam. There are more wolves in sheepskin clothing! I,for one, truly believed you are one of us, Archbishop Byrnes, with this action you took. So could you please DE-INCARDINATE them also? 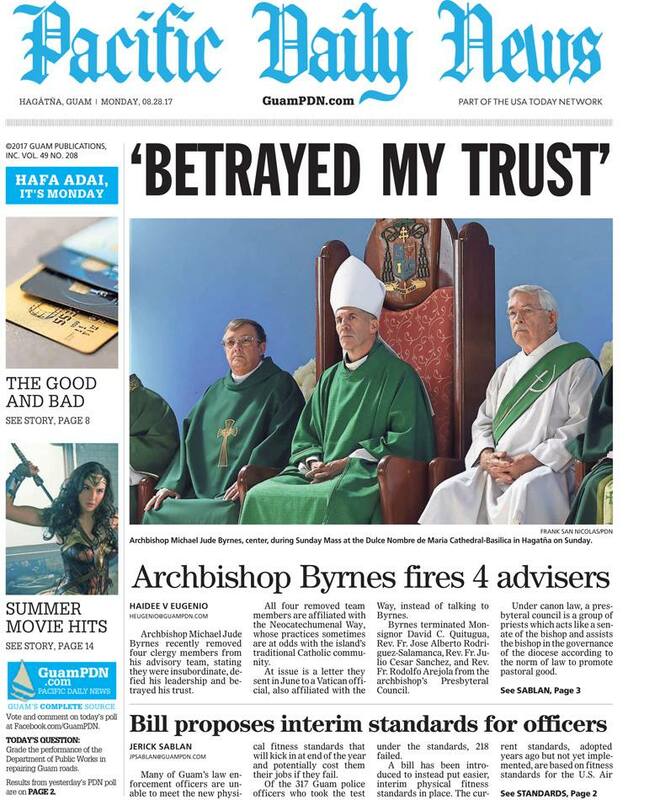 "De-incardinating" them would put them out of the jurisdiction of the Agana Archdiocese. 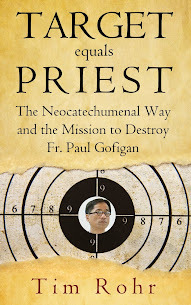 Just tell them to "go find another bishop willing to incarnate them" - that was the threat Apuron gave to Fr Paul Gofigan. Tell them you are just following the wise admonition of "their bishop", AAA. Adrian is on Guam. He celebrated a funeral Mass today at the Cathedral. Took me by surprise. Did he get his law degree already? Ha! Caught with their fingers in the Kiko jar. No one feel bad for these turncoats. They cry PERSECUTION. I see DESPERATION! I can hardly wait for the next misguided step they are led into by their puppeteer Pius. This is getting fun! I pray that AB Byrnes will be aware of how ruthless, how devious how well connected is THE ENEMY!! Knowing what a criminal Adrian is, why is Byrnes allowing him to celebrate Mass at the Cathedral? That's a gross insult to the Faithful! I've always thought that Filoni pulls Byrnes's strings. His merely symbolic anti-NCW edicts are toothless and none of the fake priests people constantly scream about have been suspended or defrocked. To me it seems like Adrian was sent to Canada on orders from Neocat chiefs in Rome. Someone knew when the law school semester was starting and he was quickly shipped off before Byrnes knew who he was dealing with. If Adrian got his canon law license, he has lame duck Byrnes over a barrel. He and his Neocat devils will blindside him coming and going. There's a lot of things Byrnes doesn't know. And he may not even have known that Adrian said Mass at the Cathedral. Permission to do that would have had to come from the rector, Fr. Paul. Byrnes knows by now that Adrian is dangerous. It's his duty to keep an eye on him. He could have told the Cathedral Rector that Adrian is a persona non grata and banned him from the place. His faculties should be revoked. Yeah>Let's see da license from Canada. Yikes, a license for someone who obviously can't spell or do his contractions. The only solution is to suspend and laicize these Judas priests. As long as their faculties remain intact, they can legally operate with Church authority behind them. If Apuron returns to Guam, his demonic support is ready to roll. If Byrnes doesn't suspend and laicize Adrian asap, he's either in cahoots with Filoni, criminally stupid, suicidal, or all three.